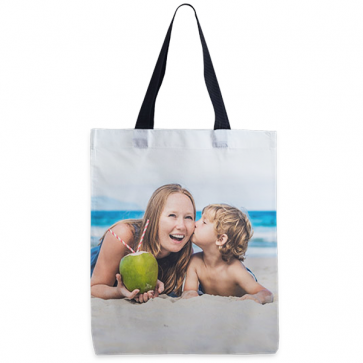 Create a personalised tote bag with your favourite image or design. Let your creativity flow freely and design your own tote bag! Surprise your friends with a new custom tote bag! With GoCustomized, you can create your own, personalised tote bag! This bag will look like no other. You are the artist. You make the choices. Just go onto our customizer and upload the image, text or logo that you would like to see on either side of your brand new custom tote bag. How about printing a photo of your cute dog, your best friends, or your favourite quote onto the bag? Your design will be printed on the cotton accessory with sublimation ink. This means that your design will be scratch-proof. There is no limit to your creativity, so start now and design your own tote bag! It's never been easier to design custom accessories. We have created a user-friendly customizer that enables you to make your own bag in only a few simple steps. All you need to do is to upload your chosen image or design from your computer, phone or social media. Next, you can use the customizer’s editing features to give your personalised tote bag an even more unique touch. Adjust the size and orientation of your design and add your name to the bag! What are you waiting for? 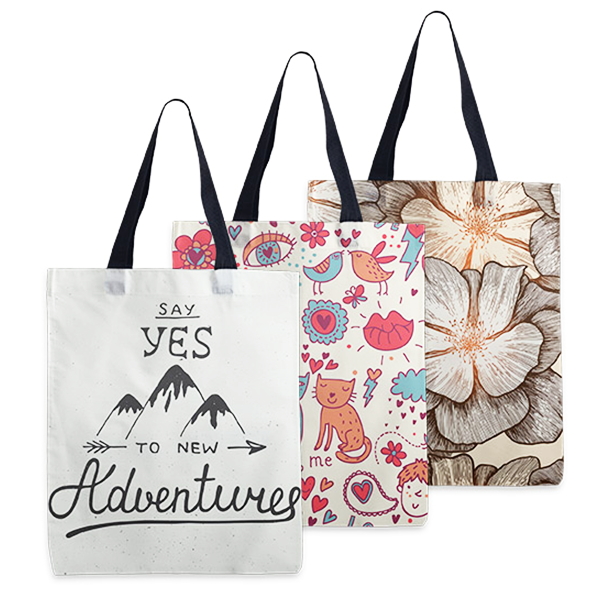 Start now and design your one-of-a-kind tote bag! Once you confirm your order, our highly-experienced production team will start producing your custom tote bag. With great attention to detail and our state-of-the-art printers, we achieve impeccable printing results. Your tote bag will be created using sublimation print, which is directly absorbed by the cotton material of the bag. Hence, it will not be possible to scratch your design off your new accessory. After your custom tote bag leaves our production facility, it will be delivered to your doorstep by one of our reliable carriers in no time. Don’t wait any longer. Make your personalised tote bag now!